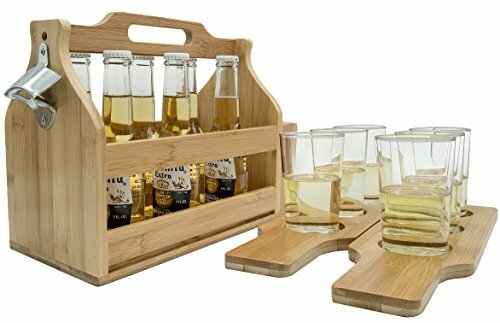 Drinks are served with the Sorbus Wooden Bottle Caddy Set! This wooden caddy set is a rustic take on a classic 6-pack to transport most beer or soda glass bottles. Both functional and portable, it features a bottle opener, two sampler paddles, and a convenient side pocket for storage. Pop off those bottle caps with the built-in opener tool and serve your guests with the sampler paddle boards. Each paddle has three designated cut-outs for drinks with a large handle to transport your brew in style. When paired with compatible glasses, the sampler paddles are great for serving microbrews, ciders, dessert samples, or seasonal specialties. This carrying set includes everything you need for your next beer tasting event or home bar. Perfect for the beer connoisseur, or simply to entertain, this caddy is ideal for any home bar, pub, or special occasion. Throw a cocktail party for your favorite social circle, or create a mini bar experience during a major sporting event. Use the versatile sampler board for mini martinis, juice samples, or signature desserts like strawberry shortcake shooters and chocolate pudding parfaits! Now you can entertain family, friends, or customers with an impressive menu. Cheers to your next brew fest, beer tasting, picnic, tailgate party, holiday, camping trip, and more! > The old-fashioned bottle opener adds a convenient touch to the bamboo design. Made of bamboo wood with metal bottle opener. Holds up to six bottles. Compact with carry handle for easy transport. Bottles in photos range from 7- 11.2 oz (Drinks NOT INCLUDED). Caddy Measures approximately 14.50" L x 6" W x 9"H. Each Paddle Board Measures approximately 13" L x 4" W (Has 2.25" round cut-outs for glasses). Makes a truly unique gift, simply pair with the recipient's favorite drinks!